The U.S. Navy is planning to loft its second in a series of next-generation narrowband communications satellites on Friday, July 19. The United Launch Alliance Atlas V is slated to boost the second Mobile User Objective System (MUOS) spacecraft during a 44-min. launch window that opens at 8:48 a.m. EDT from Cape Canaveral. The launch vehicle is an Atlas V 551, meaning it will use a 5-meter fairing and five strap-on, solid-rocket boosters. 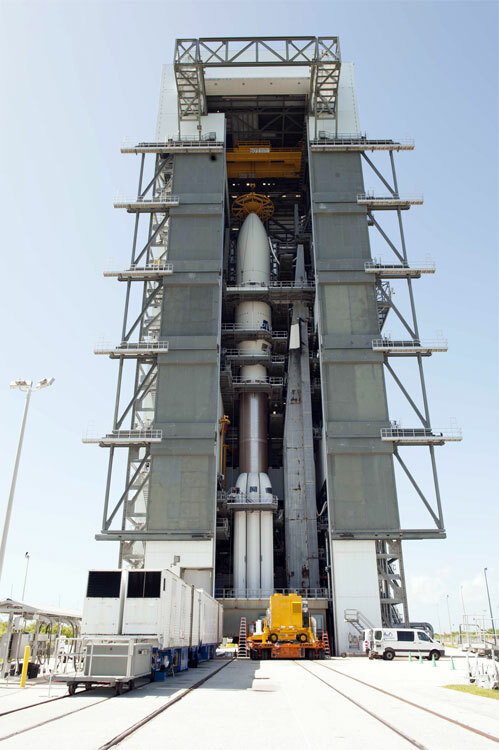 The first MUOS was launched Feb. 24, 2012, and began limited operations late last year. The constellation, ultimately planned for four operational satellites, is built by Lockheed Martin. MUOS contains a legacy ultra-high frequency communications payload, built by Boeing, as well as one using the newer Wideband Code Division Multiple Access (WCDMA) standard. Full capability of the new WCDMA payload will not be reached until this second satellite is in orbit and checked out. At that point, officials will validate its functionality, including use of the new payload, with satellites and ground systems. The WCDMA payload is intended to provide soldiers with voice, data and video services similar to those offered by commercial smart phones. Today’s narrowband system requires soldiers to be stationary to receive a signal; MUOS was designed to allow soldiers to move around the battlefield while also accessing data rates up to 10 times higher than those provided by today’s constellation. Lockheed Martin is working on a MUOS development contract worth up to $3.3 billion; the program has slipped at least two years. They are the U.S. military's heaviest spacecraft looking for rides to orbit -- the Navy's next-generation satellites providing communications to forces on the move -- and the United Launch Alliance's mightiest version of the Atlas 5 will do the heavy lifting Friday morning to deploy the second bird in the series. Liftoff of the Mobile User Objective System satellite No. 2 is scheduled for 8:48 a.m. EDT (1248 GMT) from Cape Canaveral on Florida's east-central coast. 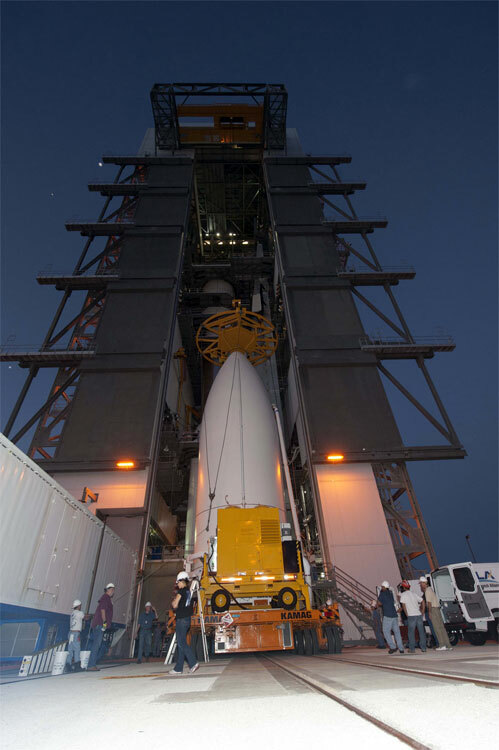 "At nearly 15,000 pounds, MUOS 2 marks the heaviest satellite launched to date by an Atlas 5," said Jim Sponnick, ULA's vice president of Atlas and Delta programs. The 206-foot-tall rocket, riding aboard its mobile launch platform, was rolled out from the assembly building to the Complex 41 pad Wednesday morning. 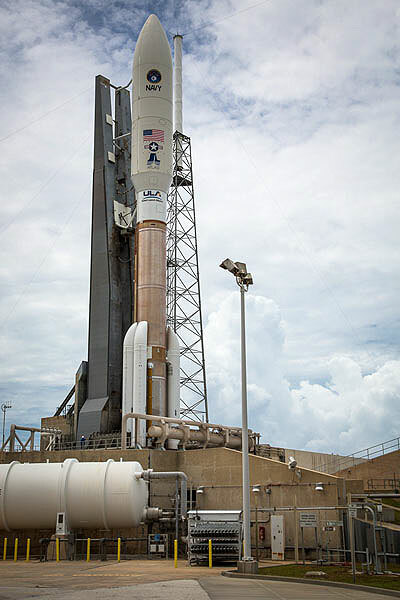 At the same time, other ULA workers just down the road at Complex 37 were conducting a countdown dress rehearsal and fueling test on a Delta 4 rocket for its launch of the Air Force's sixth Wideband Global SATCOM satellite on August 7. Atlas clocks begin ticking early Friday for the seven-hour countdown. Weather officials will be monitoring isolated showers and thunderstorms coming ashore from the Atlantic, a forecast that gives a 40 percent chance of acceptable conditions during the 44-minute launch window. With five powerful solid rocket motors mounted to the first stage, the Atlas 5 will thunder skyward in its most energetic configuration, which has been employed only three times before to launch the first MUOS satellite and hurl NASA space probes to Jupiter and Pluto. The Atlas 5, making its 39th flight in 11 years, is a modular launcher that enables mission designers to mix and match the number of solids and various nose cone selections to meet the needs of a given payload. The highly sophisticated and hefty MUOS series takes all the power. The spacecraft is packaged atop the rocket for a three-hour climb into its preliminary orbit, a highly elliptical dropoff point that requires three firings by the Centaur upper stage to achieve. From there, controllers will spend about eight days maneuvering the craft into a circular geosynchronous orbit 22,300 miles above the planet, then three days commanding the craft to spread its power-generating wings and unfurl two giant antennas on the ends of extension booms. "With the launch of the second MUOS spacecraft, we take the next large step toward providing truly global narrowband communications for our deployed warfighters around the world," said Navy Capt. Paul Ghyzel, manager of the Satellite Communications Program Office. At the heart of the MUOS satellite's communications payload are two gold mesh, umbrella-like antenna reflectors, one to provide the same type of UHF communications like previous Navy spacecraft and the other offering modernized capabilities that the new system will create. "MUOS will deliver unparalleled high-speed communications access to mobile users for decades," said Iris Bombelyn, vice president of Narrowband Communications at satellite-builder Lockheed Martin. "With over 20,000 terminals that are capable of connecting to this secure mobile (satellite communications) system, we are at the cusp of our potential. The MUOS satellite provides not only ongoing support for the legacy UHF Follow-On users in the field but a myriad of new services, bandwidth, capacity and applications to mobile users." Coverage to legacy users will transmit through a 17.7-foot-diameter reflector on the bottom of the MUOS craft and the advanced, multi-beam features of MUOS to significantly increase the transmission capacity over the Navy's previous satellites will use a large 46-foot reflector atop MUOS. All U.S. military forces rely upon Navy satellites for Ultra High Frequency narrowband communications. UHF offers small, portable units that forces can carry into battle and the frequency enables communications in urban canyons and mountainous terrain, penetrating foliage and transmitting through bad weather. Each MUOS satellite has 16 times the capacity of the aging UHF satellite constellation. What's more, the new satellites not only support the current user terminals in operation but also creates a new "rugged smartphone" network to provide 3G-like cellular telephone and data services across the globe. "One of the way we frequently describe the new capabilities that MUOS brings is think of a cellphone," Ghyzel said. "The architecture that we've built with the satellite constellation and with the global ground network, the satellite is the celltower. Anybody that is using a radio that is capable of communicating with MUOS, when they speak their transmission is picked up by the satellite and then routed like a cellular system would route to wherever it needs to be to talk to the guy on the other end. "So if you are driving down the interstate and you walk to talk to a guy one county over, you may be using the same tower. For Bob to talk to Jim. "But if Bob is in Florida and wants to talk to his wife in Seattle, he can pick up a cellphone, the tower next to the interstate he is driving on is going to pick up that call, but then it is going to go through a fiber optic network to get to a celltower that is closest to his wife in Seattle and that tower is going to send that call to her cellphone. "Much like for us in MUOS, if you got somebody that's in Hawaii that needs to talk to a ship that's 200 miles off Hawaii, that traffic is going to go through the satellite that is over the Pacific. "But if that ship commander needs to talk to somebody that is in Afghanistan, then they are going to transmit over MUOS, the satellite over the Pacific is going to up that transmission, but (it is) then routed through the rest of the MUOS network to the satellite that's going to be over the Indian Ocean, eventually, and then down into Afghanistan. "You can think of the satellites as the celltowers in the sky. That's a really good way to think of how the system works." 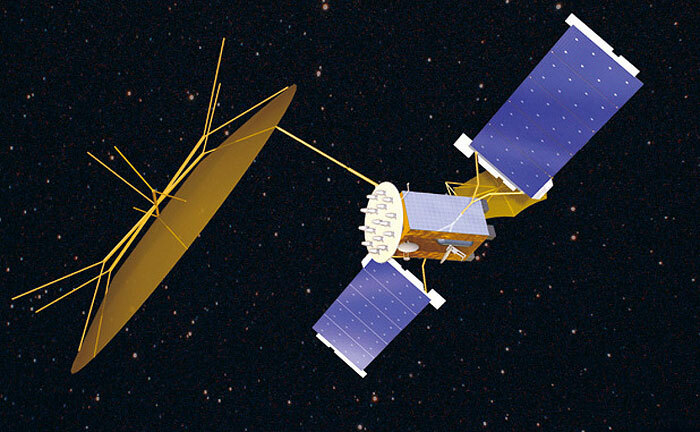 The MUOS craft were built on Lockheed Martin's A2100 satellite design used by dozens of previous communications spacecraft. All five MUOS craft are clones to each other, with four slated to be operational satellites in the constellation and one considered an on-orbit spare. MUOS 1 was successfully launched on Feb. 24, 2012. MUOS 3 is eyeing a launch in about 12 months, followed by MUOS 4 in the summer of 2015 and MUOS 5 some time after that. The Atlas rocket has been the expendable launch vehicle of choice for the Navy's narrowband UHF communications satellites dating back several spacecraft generations to the 1970s, exclusively carrying the entire Fleet Satellite Communications System, Ultra High Frequency Follow On series and now MUOS. A variety of Atlas-Centaur versions have been employed on the previous 20 flights since 1978, all from Cape Canaveral. The US Navy’s MUOS-2 satellite was launched on Friday morning aboard a United Launch Alliance Atlas V. Liftoff from Space Launch Complex 41 at Cape Canaveral was re-scheduled to 13:00 UTC (09:00 local time) after an earlier upper level winds constraints. The spacecraft is currently being delivered to its initial destination via the Centaur Upper Stage. MUOS-2 is the second in a series of five planned Mobile User Objective System (MUOS) satellites, part of a six billion dollar program to replace the UHF Follow-On (UFO) satellites currently used by the US Navy. The prime contractor for the MUOS program is Lockheed Martin, with the spacecraft based around the A2100M satellite bus. At a gross mass of around 6,740 kilograms (14,900 lb), MUOS are among the heaviest unclassified spacecraft ever placed into geosynchronous orbit. A BT-4 liquid rocket motor, produced by IHI Corporation of Japan, will be used to perform on-orbit maneuvers. The satellite’s 14-metre (46-foot) reflector antennae are produced in Melbourne, Florida by Harris Corporation, while part of the communications payload is constructed by Boeing IDS. General Dynamics and Ericsson are responsible for developing the ground segment of the MUOS system. 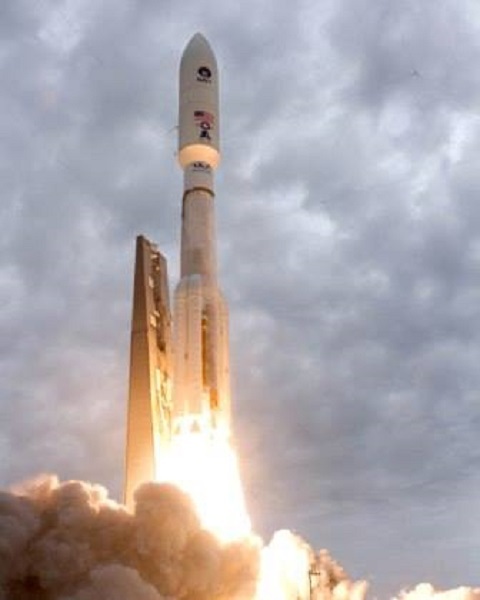 The first MUOS satellite, MUOS-1, was launched in February 2012, also by an Atlas V. That spacecraft completed initial on-orbit testing on 17 July last year, ahead of acceptance testing by the US military. A Navy program, MUOS is one of several series of communications satellites operated by the US military. The US Air Force operates the Wideband Global Satcom and Advanced Extremely High Frequency program, both of which are expected to see launches in the next two months. The National Reconnaissance Office also has its own communications satellites, the Satellite Data System (SDS), and several other spacecraft, such as the mysterious PAN satellite, have been launched. The US military was also reported to have bought the AMC-14 satellite from SES after it failed to achieve geostationary orbit in 2008. The rocket that launched MUOS-2 was an Atlas V 551, tail number AV-040. Friday’s launch marked the fourth flight of the 551 configuration, which is the most powerful version of the Atlas V, and the thirty-ninth Atlas V launch overall. First flown in 2002, the Atlas V is, along with the Delta IV, one of two Evolved Expendable Launch Vehicles (EELVs) developed to meet the requirements of the US military. Both the Atlas V and Delta IV are operated by United Launch Alliance, which was formed in December 2006 to take over operations of the EELV fleet and Boeing’s older Delta II rocket. 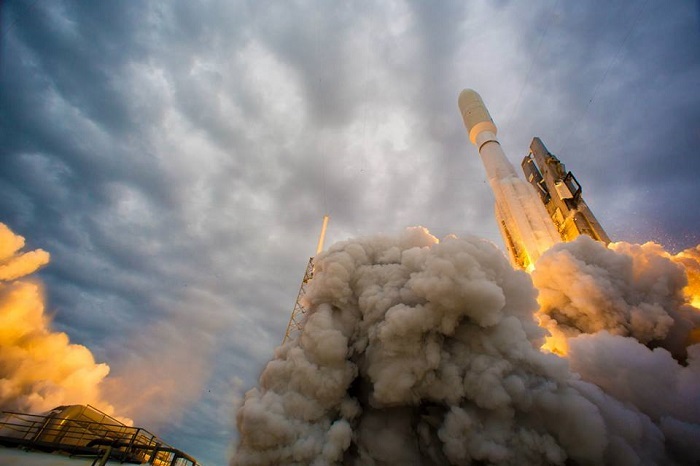 In its thirty-eight flights to date, the Atlas V has achieved a near-perfect success record, with only one partial failure – a fuel leak caused by a valve failure led to AV-009 placing the USA-194 spacecraft into a lower-than-planned orbit in 2007. Atlas is one of the most reliable rockets flying – its last outright failure occurred over 20 years ago, when in March 1993 the UFO-1 satellite was placed into an unusable orbit after an engine failure. That launch used an Atlas I. The Atlas V 551 was first used for the 2006 launch of the New Horizons spacecraft bound for Pluto, with subsequent launches deploying the Juno probe to Jupiter and the MUOS-1 satellite. The first stage of the Atlas V is a Common Core Booster, powered by a single RD-180 engine burning RP-1 and liquid oxygen. Derived from the RD-170 engine developed for the Soviet Union’s Energia and Zenit rockets, the RD-180 first flew in 2000 on the maiden flight of the Atlas III, and Friday’s launch marked its 45th flight. Ignition of the RD-180 came 2.7 seconds ahead of the scheduled launch time, allowing the engine to reach launch-ready thrust by T-0, at which point five Aerojet solid rocket motors attached to the first stage also ignited. Liftoff occurred at T+1.1 seconds, with the rocket pitching over and performing a roll and yaw maneuver to attain its launch azimuth around 2.8 seconds later at an altitude of 26 metres (85 feet). Forty-four seconds after liftoff, the rocket passed through the area of maximum dynamic pressure, or Max-Q. Burnout and separation of the solid rocket motors, which augment the RD-180′s thrust during the early phases of the flight, occurred around a minute later; the first two boosters separating 103.3 seconds after launch, and the remaining three followed a second and a half later. Separation of the payload fairing came at T+191.5 seconds, with the Forward Load Reactor separating five seconds later, however the exact times were dependent on atmospheric conditions and heating. Six different payload fairings are offered for the Atlas V; three four-meter variants and three five-meter fairings. For Friday’s launch a medium length five-metre fairing was used. This was 23.4 meters (76.8 feet) long with a diameter of 5.4 meters (17.7 feet). The five-meter fairings encapsulate the upper stage along with the payload, with a Forward Load Reactor, attached near the top of the upper stage, used to dampen vibrations in the fairing to provide a better acoustic environment for the payload. The upper stage of the Atlas V is a Centaur, a descendent of a stage first flown in 1962 which made its 200th flight on the last MUOS launch in 2012. For the Atlas V both single and dual-engine Centaurs are available, however only the single-engine configuration has been flown to date. The engine used on the Atlas V Centaur is an RL10A-4-2, which is fuelled by cryogenic propellant; liquid hydrogen and liquid oxygen. Centaur is expected to make three burns during Friday’s launch. Following depletion of its propellant, the Common Core Booster’s engine cut off around four minutes and 21 seconds after launch. Six seconds later, the Centaur separated and begin its prestart procedure. RL10 ignition occurred 9.9 seconds after staging. The Centaur’s first burn lasted seven minutes and 46.9 seconds, before the flight entered a seven-minute and 59-second coast phase. Following the coast, the second burn lasted five minutes and 55.7 seconds. After the second burn, the launch entered an extended coast phase, lasting 142 minutes and 36.1 seconds. The final burn, which will follow this, is expected to last just 59.1 seconds. Three minutes and 39 seconds later, MUOS-2 will separate from its carrier rocket. The target orbital parameters for the deployment of MUOS-2 are an apogee of 35,787 kilometers (19,323 nautical miles, 22,237 statute miles); a perigee of 3802 km (2,053 nmi, 2,362 mi); inclination of 19.1 degrees to the equator, and an argument of perigee of 179.0 degrees. MUOS-2 will then use its own propulsion system to maneuver to geostationary orbit. AV-040 was the sixtieth rocket to launch from Space Launch Complex 41 (SLC-41) of the Cape Canaveral Air Force Station. Built during the 1960s for the Titan IIIC as part of the Titan Integrate-Transfer-Launch Complex, LC-41 as it was then designated saw its first launch in December 1965 when a Titan launched the LES-3 and 4 satellites, along with Oscar-4 and OV2-3. A Vertical Integration Building (VIB), shared with LC-40, was used to stack the rockets before they were rolled out to the launch pad for payload installation in a cleanroom atop the pad’s Mobile Service Tower (MST). The MST was demolished in 1999, while the VIB was demolished in 2006 following the end of Titan launches from SLC-40. In total, twenty-seven Titan launches took place from SLC-41; ten Titan IIICs, seven Titan IIIEs, and ten Titan IVs – all Titan IVAs except for the final Titan to launch from the pad; a Titan IV(402)B which failed to place a DSP satellite into geosynchronous orbit. The last Titan IVA launch from the pad also failed due to a guidance problem. These two launches were part of a run of three consecutive launch failures which the Titan IV suffered during 1998-99. The Atlas V has made 33 of its 39 launches from SLC-41, beginning with its maiden flight in 2002. A new Vertical Integration Facility, located closer to the pad than the old building, is used to assemble the rockets, including their payloads, with rollout to the pad occurring a few days before launch. Friday’s launch was the ninth US orbital launch attempt of 2013, and the thirty-eighth or thirty-ninth overall for the world, depending on a rumored Iranian launch failure believed to have occurred around 17 February.